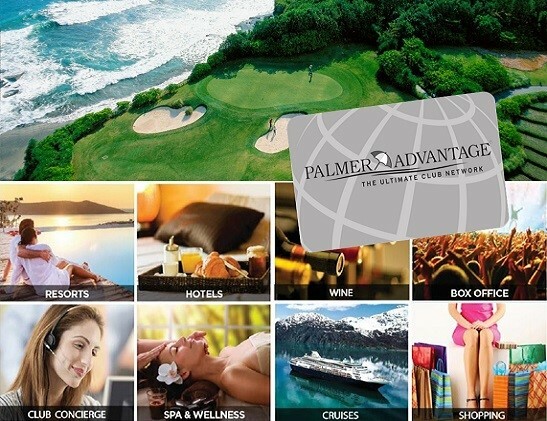 As a Member of Seven Springs Golf & Country Club Palmer Advantage benefits are provided complimentary to you! When you join as a new Member you will automatically enrolled to gain access to the global golf network, access to other private clubs, private member travel & concierge services, and many other lifestyle & leisure benefits! Palmer Advantage® The Ultimate Club Network is designed to the complement the lifestyles of private Club Members and their families with private club access, member-only experiences, incredible savings, and unique opportunities. Click above to see a quick video highlight of Palmer Advantage. Click here to view the listing of ‘cart fee only’ clubs in the U.S.
Resorts offering a range of benefits from ‘cart fee only’ access to preferred rates. Many offer access to other on-site amenities such as athletics, racquet sports, and more where available. Online merchandise and goods store with a diverse and ever-changing inventory of products from luxury clothing to home goods. and you can also download this helpful benefits fact sheet (PDF).